Heat oven to 425°F. Line large cookie sheet with parchment paper; spray paper with cooking spray. In shallow pie pan, mix bread crumbs and seasoned salt; set aside. In another shallow pan, beat egg and water with wire whisk until well blended; set aside. 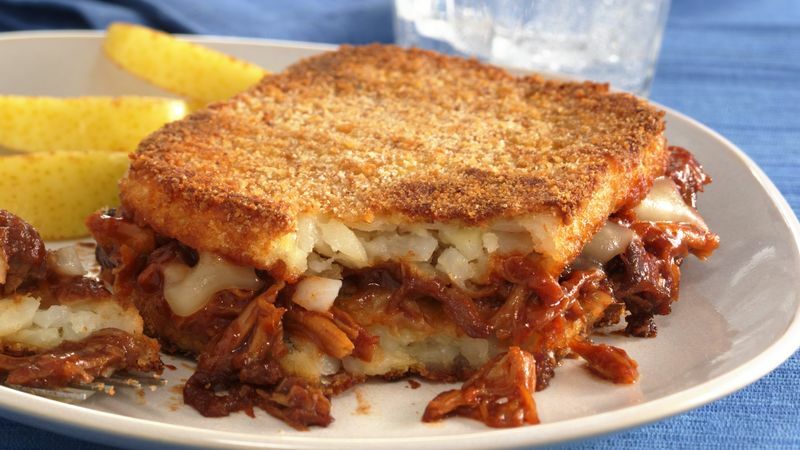 On each of 4 of the frozen hash-brown patties, place 1/4 cup barbecue sauce with shredded chicken. Top each with 1 slice cheese, folded to fit. Cover each with remaining potato patty. Carefully dip both sides of each stack into egg mixture; coat each with bread crumb mixture. Place on sprayed paper-lined cookie sheet. Bake at 425°F. for 15 minutes. Remove from oven. Carefully turn stacks over. Return to oven; bake an additional 11 to 16 minutes or until centers are thoroughly heated and cheese is melted.